Question? Is Morgan Deaf. The short Answer = NO! There are a lot of rumours going around that Morgan is deaf. Unfortunately these are perpetuated by the pro-captivity fans who have not bothered to check their facts. Morgan was identified as coming from the Norwegian population of orca, based on her DNA as well as her vocal repertoire (she speaks Norwegian-orca). These repertoires are culturally based and as such must be learnt. In order for Morgan to speak Norwegian-orca, she must have been able to hear Norwegian-orca at some stage in her life. When she was at the Dolfinarium Hardewijk there were no issues with any aspect of her health (and in fact she was given a clean bill of health). 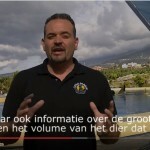 In April 2012 (five months after Morgan had arrived at Loro Parque), Dr Javier Almunia, in charge of the orca at Loro Parque, was filmed by a group in favour of Dolfinarium Harderwijk. He made the following statement “Morgan’s repertoire is getting sounds from the other animals” (time code 11m:28s). This clearly indicates that she could hear the other orca for at least the first five months after being transported to Loro Parque. More recently, Loro Parque have stated that she has a ‘hearing deficit’ NOT that she is deaf. The Free Morgan Foundation, along with many other NGO’s have repeatedly requested health checks (including hearing tests) of Morgan, which are independent of Loro Parque. These requests have been refused. This indicates to us that Loro Parque clearly has something significant to hide. A study about Morgan’s hearing, paid for by Loro Parque, was conducted in November 2012. The scientists measured auditory evoked potentials (AEPs), which are small signals produced by the brain in response to hearing a sound. The tests compared Morgan to three of the other orca at Loro Parque and used two methods; one used three electrodes embedded in suction cups and positioned along the dorsal midline of the animals whilst they were in the water and the other method was used when the animals were out of the water, called a ‘jawphone’. The later of which they stated in their report “the jawphone was not calibrated against a killer whale and received sound pressure levels should only be considered estimates at this time.” (In other words, ‘you can’t rely on the results from this aspect of the study’). Furthermore, the authors also stated the following with regards to two of the three types of noises they used to measure the orca; “Efforts to collect sufficient data for comparing the frequency-specific auditory sensitivity of the killer whales was not achieved using SAM tones or tone pips.” (In other words their tests consisted primarily of checking Morgan’s hearing in relation to clicks which are only one small part of the vocal repertoire produced by orca). In that context it is also vital to read what the authors stated about this aspect of their study: “Clicks have the greatest bandwidth and produce the most robust evoked response, but they lack the frequency specificity required for comparisons at particular frequencies.” [our emphasis]. (In other words, we only tested clicks, but they can’t be compared to what we might find using other sounds). And the authors then go on to state; “Furthermore, no useful results were obtained with the whales completely submerged”. With this statement it is very important to note that this meant that their study therefore did not produce any results from two of the three methods used (submerged or in air), but only from the partially submerged tests. These restrictions are noted by the authors themselves and the report was signed by Mark Leopold, one of the ‘seven experts’ who was consulted back in 2010 by Dolfinarium Harderwijk with respect to Morgan’s suitability for release (he was against her rehabilitation or release and has severely criticised the Free Morgan Foundation and those working within its framework). Regardless, the flaws of the study were outlined by people who conducted the study and, approved by someone who had a history with wanting to keep Morgan in captivity. Therefore, they did not come from the Free Morgan Foundation or any other NGO. Nevertheless, no matter who wrote them, they clearly illustrate the compromised nature of the research project, which was conducted between when the commercial shows are held at Loro Parque and over a three day period. At no point in the report do they actually give the frequency range of any of the tests, nor the results. These would be expected to have been included for clarification of the study and the results as different frequencies produce different responses. Frequencies, to those who don’t study acoustics, are the ‘pitches’ – a training whistle has a high pitch as does a clapping noise or even running your fingernails down a board or a little girl screaming, whilst a drum or the rumble of a truck driving past has a low pitch (low frequency). Finally, the report was published four months after the study, on the 28th of March 2013. It clearly stated that Morgan appears to have some hearing deficiency but the scientists did NOT determine that she was deaf. 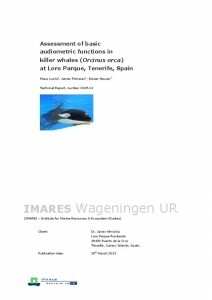 They further stated that their study could not have determined if she was deaf, anyway as this “cannot be determined through currently employed electrophysiological means.” Their 14 page report “Assessment of basic audiometric functions in killer whales (Orcinus orca) at Loro Parque, Tenerife, Spain” is available through Loro Parque, but we also reproduce it here. 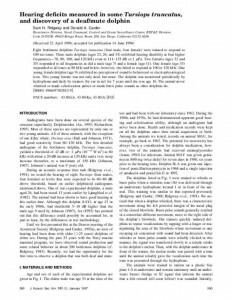 In their conclusions the authors first state “The lack of a click-evoked response in the killer whale, Morgan, suggests that this animal suffers from a hearing deficit” [our emphasis] and then later go on to say that it is “possible” that she has a hearing problem but that they can’t test for it. But they do highlight that more studies should be done (and please note again that Loro Parque has not conducted these, or if they have, that they have made the results public). What if Morgan has hearing problems? Should Morgan ever be removed from the concrete tanks she is currently imprisoned in, she will have to go through an extensive and involved rehabilitation program. During that her hearing will be properly assessed and evaluated by orca and acoustic experts. If, after her rehabilitation process it is deemed that she can be released and that she does in fact have a hearing problem, then every care will be taken to help her. There is at least one scientific (peer-reviewed) article about a deaf (and mute) dolphin who had been living successfully in the open ocean with conspecifics (individuals of the same species). With that evidence it can not be ruled out that this isn’t possible for Morgan to return to the open ocean too.